Snapshot of Nurglon (r) dissolving. Inbredburg, The Very Deep South: Nurglon (r) is dead. 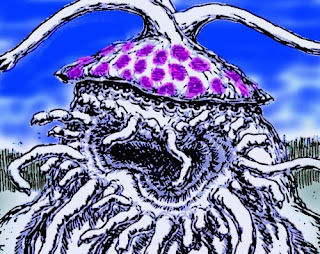 According to witnesses in the town of Inbredburg, the 150-foot tall Presidential/Vice-Presidential candidate swallowed POX News' reporter Sean Inannity - and then rapidly started to dissolve into a reeking, pink, rotting mass, covering an area the size of the Astrodome. Cleaning up the remains of Nurglon may take months, and the area is currently being sealed off by federal authorities as a bio hazard. A witness to her/its tragic demise was heard saying: "So not even Nurglon could stomach Sean Inannity." The late talk-show host Sean Inannity, admired by millions of conservative TV viewers, is now being praised by colleagues. "Sean would never let mere facts get in the way of truthiness," says fellow talk-show host Stu Colburp. "Sean Inannity was the voice of the real America," says talk-show host Rash Limburger. "His face should be printed on all my little pill boxes, as a tribute." Barack Obama has so far been unavailable for a comment. In related news, Nurglon's five million offspring have since fled the country. 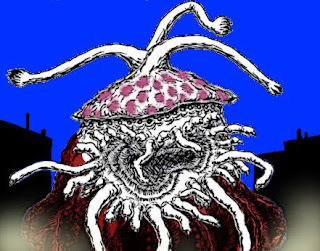 Unconfirmed reports from Asia claim that the millions of fleeing mini-Nurglons are now storming the coast of North Korea. Experts are in disagreement whether this would make living conditions in North Korea better or worse. Nurglon Volunteer Admits Chopping Off Own Foot, Blaming "Socialists"
POX News, Oct.25: 19-year-old Bobbi Jo Sispak, college student and campaign volunteer for Nurglon (r), today admitted to giving false and misleading testimony the police. Ms. Sispak had previously told the police that she was attacked by "Socialists" who chopped off her left foot and jammed it into her mouth, and then left her for dead. However, when local police found the weapon - a chainsaw - covered with only her own bloody fingerprints, Ms. Sispak was questioned again. When confronted with the evidence, she broke down and admitted her deception. She had used the chainsaw to sever her left foot, then stuffed it in her mouth and pretended to be the victim of a gang of "Socialists." Sispak failed to give a clear explanation of her motive, except that she "only wanted to serve Nurglon, mistress of Great Cthulhu and a true American hero." POX News asked Bobbi Jo Sispak to clarify herself. She said: "Y'know... Socialists. Dark-skinned, vicious Socialists, always looking to mutilate white women." "Us real Americans must avenge my baby girl for putting her foot in her mouth!" Joe-Bob Sispak, campaign volunteer for Nurglon (r). Angela Hoy: "The World's Worst Book Proposals"
Funny: The World's Worst Book Proposals. Chapter 3: When Things Go Warong"
Warong indeed. Hoy's column is an ongoing feature, so be sure to click the links to previous hilarious installments. Now, I'm all for encouraging people to try writing. But how about practicing writing just for fun and self-education, before you launch your professional writing career? The saying goes, it takes ten years to become a skilled writer. 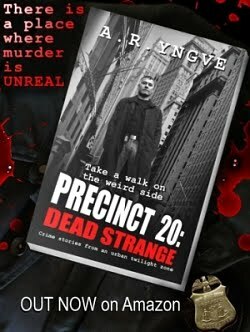 (It took me slightly longer to get my first novel published.) I think people who fail either do not try hard enough, or get their goals confused. 3. It must be finished work. Most people who fail at writing ignore one or several of the above. Don't be one of them. 3. First and foremost, send finished work. Presidential/Vice Presidential candidate Nurglon (r), who usually does not wear clothes, has now taken to fashion. In Inbredburg, Nurglon supporters cheered on their candidate as she/it showcased its/her first complete red dress. 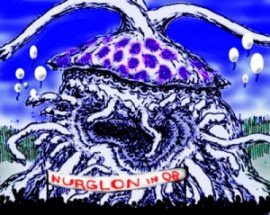 But Nurglon's new style may come at a high cost to the U.S. economy, warn financial analysts. Many of them are afraid to criticize Nurglon openly. "It's not just a question of running out of campaign funds," says a source who wishes to remain anonymous. "The Republican Party has taken huge short-term loans to pay for Nurglon's dresses, and staked everything on her winning the election. If she doesn't win and can't create bailout packages to cover the debts, the GOP goes bankrupt." "And none of the money paid for these gigantic garments goes back into the U.S. economy. Thousands of Chinese textile workers are employed to make them. India exports 5% of the fabrics it produces to America for Nurglon clothing alone." "This textile and clothing bubble has been growing way too fast, and could burst on Election Day." In a recent blitz of open-air rallies across rural America, Presidential/Vice Presidential candidate Nurglon (r) has launched the concept of "Un-America." N: ON THE COASTLINES, IN THE BIG CITIES, LIES... UN-AMERICA! CITIES THAT ARE ELITIST, HARD-HEARTED... AND HARD TO CHEW! N: WHEN I AM ELECTED PRESIDENT, I SHALL ORDER MY FIVE MILLION YOUNG TO EAT UN-AMERICA! WITH A SIDE ORDER OF SOCIALISM! N: AND THEN THIS GREAT NATION SHALL BE PERFECT AGAIN, FOLKS! YOU BETCHA! In related news: after the abovementioned rally, central Rottenville was burned down by overzealous Nurglon supporters while they tried to ignite an effigy of Barack Obama. According to witnesses, the effigy was carried out of the fire unscathed. In an exclusive statement to POX News before the third and final 2008 presidential debate, Presidential/Vice Presidential candidate Nurglon (r) declared that John McCain has now been turned into a zombie and released from Nurglon's mouth. "THE McCAIN CORPSE SHALL DO MY BIDDING. IT SHALL EXPOSE THE SHINING ONE AS AN ENEMY OF ALL THAT I STAND FOR... FAMILY VALUES, FAITH, STRONG LEADERSHIP, FOLKSINESS AND STRAIGHT TALK." "BOW DOWN AND WORSHIP NURGLON, GOSHDARN IT." POX News, Oct. 11: Witnesses at Nurglon's most recent public speech have heard cries for help from inside Nurglon's giant, gaping mouth, which may come from the missing John McCain. The witnesses said that while they were listening to Nurglon (r) speaking, they heard muffled shouts from somewhere along its/her middle row of teeth (Nurglon has three known rows of teeth, each counting approx. 200 claw-like molars) - and that it sounded like McCain's voice. According to witnesses, the shouts sounded something like, "Help! Help! I'm stuck between her teeth and I can't get out!" and "Somebody help! She's eating the entire party!" POX News has asked several prominent dentists if it would be possible to extract a person alive from Nurglon's jaws. They all declined to answer. 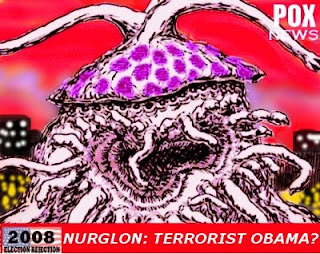 Sean Inannity: Joe-Bob... you and your friends, die-hard Nurglon supporters, are saying that Barack Obama is a witch. S: But how do you know he's a witch? J: He turned me into a newt! S: It does look like Obama is going to win the election. Do you expect your candidate, Nurglon, to bow out gracefully? J: No! Nurglon must win! She's the only one who can save us now! S: From the economic crisis? J: No, ya dope! From the elves! J: Yeah! See, Nurglon's been givin' us a few hints who's really behind them bad loans and risin' prices and stuff! It's all the work of a global conspiracy of elves! But Nurglon's gonna eat all the elves and then the problems are going away! Nurglon forever!! Nurglon: FOLKS... THE SHINING ONE HAS BEEN TO COUNTRIES YOU HAVEN'T BEEN TO! N: HE CAN READ... AND WRITE! N: WHAT DOES THAT MAKE HIM? N: THE SHINING ONE IS DIFFERENT! NOT ONE OF US! HE'S A FRIEND OF PEOPLE WHO READ AND WRITE BOOKS! A FRIEND OF TERRORISTS! N: NOW MAKE SURE NURGLON BECOMES YOUR RULER AND OVERLORD... TO SAVE THE CHILDREN FROM TERRORISM! THE JUICY, TASTY CHILDREN! Buy your Nurglon merchandise in the 2008 Election Rejection Shop! 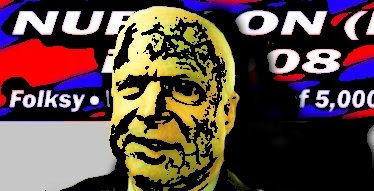 POX News, Oct. 6: During a recent political rally, POX News asked Presidential and Vice Presidential candidate Nurglon (r) about the mysterious disappearance of John McCain, whom Nurglon replaced after having replaced Sarah Palin. Sean Inannity: Nurglon, I'll be frank with you. Did you eat John McCain? Nurglon: NO! NO! GOSH GOLDARN IT, NO. N: HE'S A HECKUVA TOUGH OLD MAN. THAT'D BE LIKE EATING AN OLD SHOE WITH THE STRINGS ON. HE'D TASTE GOSHDARN AWFUL, AND THAT'S THE PLAIN TRUTH. S: Seems your speech has become increasingly afflicted with "folksiness." Is this going down well with core conservative voters and hockey moms? N: BOW DOWN AND WORSHIP NURG...! I MEAN, GOSH! YEAH! I'M DOWN WITH THEM HOCKEY MOMS. Y'ALL. S: And how do you respond to the close poll numbers? Do they worry you? N: I DON'T BOW DOWN TO THEM ELITE TYPES WITH THEIR HIGH-FALUTIN' STATS AND NUMBERS AND WHATNOT. FRIENDS. S: Well, you certainly still have strong support in the South and the heartland. N: RIVERS OF BLO... I MEAN, I'VE ALWAYS HAD A SOFT SPOT FOR OL' DIXIE. NOW BOW DOWN TO NURGLON, Y'HEAR? 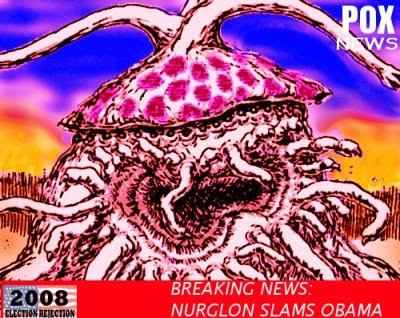 Q: Nurglon, do you have anything to add to your previous comments about your opponent, Barack Obama? Nurglon: THE SHINING ONE IS WEAK! WEAK!! HIS PITIFUL HUMAN CONSCIENCE FORBIDS HIM TO WAGE TOTAL WAR ON MANKIND, AS I SHALL WHEN I AM ELECTED! Q: When you say "total war," do you mean the states which sponsor Al-Qaeda in the War On Terror? N: NO. THE OTHER ENEMY. Countless conservative bloggers and pundits have praised Nurglon for this statement, which they claim as proof of Nurglon's necessary "toughness" to rule America. To quote one blogger: "Nurglon in '08! You're either with her or against her!"